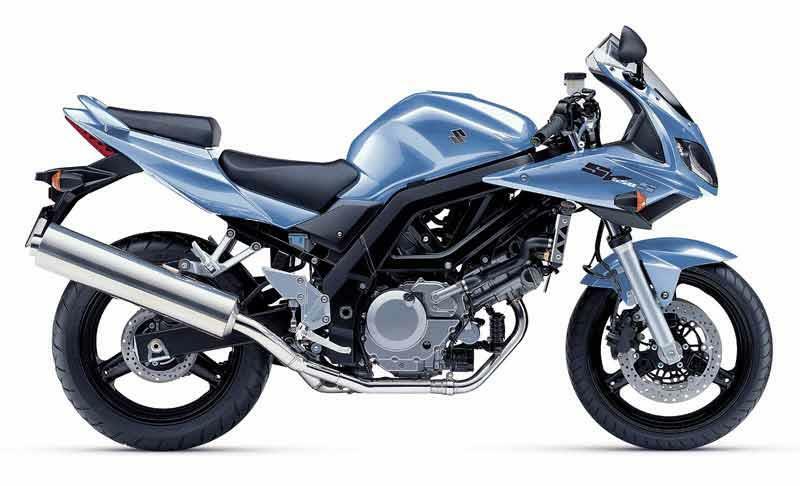 The Suzuki SV650 is a stylish yet straight forward 650cc V-twin all-rounder that manages to flatter both novices and pro's alike. It's cheap both to buy and insure too, so it's easy to see why it's been such a sales success for Suzuki. The SV650S makes up for a slight power deficit with a good usable spread of torque across the rev range, plus handling is great for it's class and good enough to embarrass riders on faster and more focused machinery. 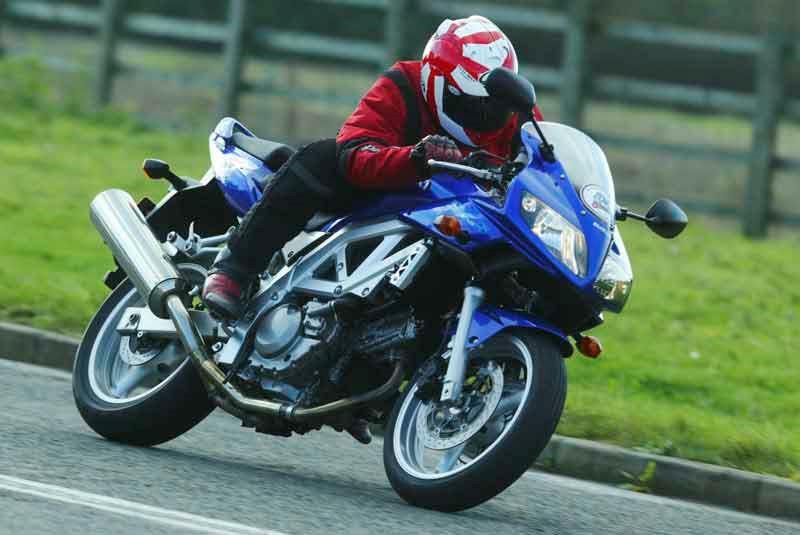 Commute, go for weekend blasts or even venture on track... you'll find the SV650S can do it all. SV owners are split on whether R&G or motoslider crash bungs are better, but all agree that some form of crash protection is a useful mod. 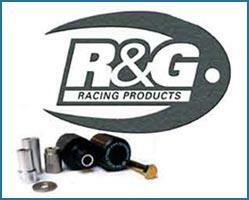 Both companies produce SV-specific crash protectors, but the more complex bracket construction of the R&G's means that they are more expensive to buy than the motoslider equivalents. The choice in the end is influenced by personal preference as much as anything else, but make sure you consider both options before buying. A lot of bikes now come with inadequate front mudguards that don't protect the engine and down pipes from dirt kicked up by the front wheel. 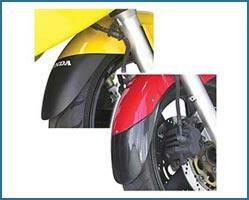 The sv is particularly at risk since the plug for the front cylinder is exposed. A Fender Extender is a great way to protect the plug from what one owner called 'soggy front plug syndrome', especially if you ride in winter. This easy to fit add-on may save you money in the long run. These are styling accessories with a practical side. Skidmarx rear huggers are styled to enhance the look of your bike whilst offering under-body, shock and linkage protection. Made from glass fibre. If your machine is not fitted with a hugger, you really should consider one, it serves to protect your rear bodywork, shock absorber, suspension linkages, etc from the rigours of our weather and they look pretty trick too. Scorpion gets hold of new models as soon as they're available. Then it's straight into the Dyno room where they test the bike with the O.E.M. exhaust still fitted to see where improvements can be made - not just in power and torque, but also ground clearance, ease of fitment and looks. 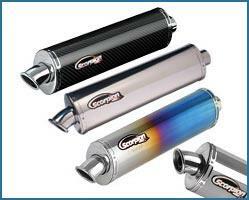 Scorpion exhausts are designed to boost power, not just at peak revs, but through the RPM range, giving you greater throttle response and improved overall performance - especially in the mid-range. 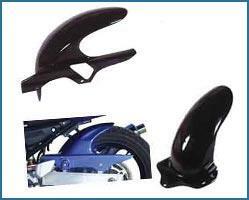 Standard rubber brake hoses can gradually stretch and bulge with use, reducing braking pressure and feel at the lever. 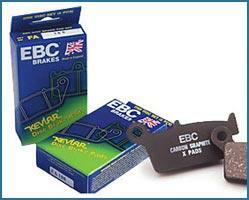 The rubber is also porous, allowing water to slowly be absorbed into the brake fluid. Braided lines cure these problems and help to prevent brake fade... plus they looks pretty cool. HEL lines are available in a range of colours to match your bike, plus they come with a lifetime warranty. The fittings are stainless steel so you don't have to worry about rusting anymore either. Oiling your chain can be a hassle, especially if you do alot of miles, but with a Scottoiler you barely ever have to worry about it and they claim it improves chain life. The latest model has a revised design for improved summer and winter operation, the oil dispensing assembly can be bolted to the end, or glued to the underside of the swing arm. Range of approximately 500-1,000 miles between refilling, depending on the weather. 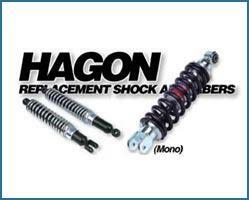 Hagon Progressive Fork Springs are designed for improved handling and ridability. The progressive winding means that as the suspension becomes compressed the springs become stronger. Like most budget bikes, the standard springs on the SV650 are a little soft so these can make a huge difference to the handling. 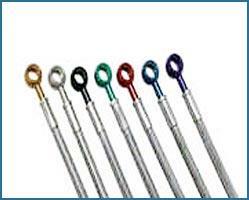 They also give the correct damping characteristics without re-valving. If you're after a bigger improvement, alot of US sv owners on svrider.com fit a GSX-R front end, which is a relatively straight-forward bolt-on job. As used at MCN and Performance Bikes, the R&G Licence Plate Holder is made from lightweight aluminium and replaces the very large, original plastic licence plate holder. 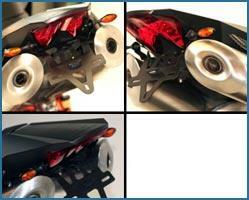 Each licence plate holder is made specifically for each model and comes with all necessary holes drilled and, where necessary, it comes with a neat little built-in licence plate light and optional red reflective tape (the side holes are sized to take mini indicators but can easily be bored out for wider indicator stalks). The Tech 7 Airflow windscreen (Double Bubble) has an aggressive upward sweep that pushes air higher without creating the turbulence normally associated with flip-up type touring screens fitted to sports bikes. They're based on race-proven designs and have TUV and ABE type approval. All Airflow screens are available in a wide range of colours and are supplied with screen edging trim. 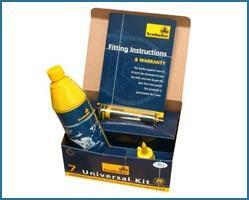 They're also designed to use the bike's original fixing points, so no drilling or cutting required. Owners also recommend the double bubble screen from Powerbronze. If you want a little more bite in your brakes, these are for you. These pads benefit from the highest friction HH rating for maximum stopping power, made from sintered copper alloy like original pads for longer life and perfect braking under all riding conditions, wet, dry, hot or cold. The unique double segment vented design keeps the pads cooler and prevents pad drag and overheat or fade. Still, bare in mind that Suzuki recommend official pads, which they test thoroughly, and cannot guarantee braking performance if non genuine pads or discs are fitted. 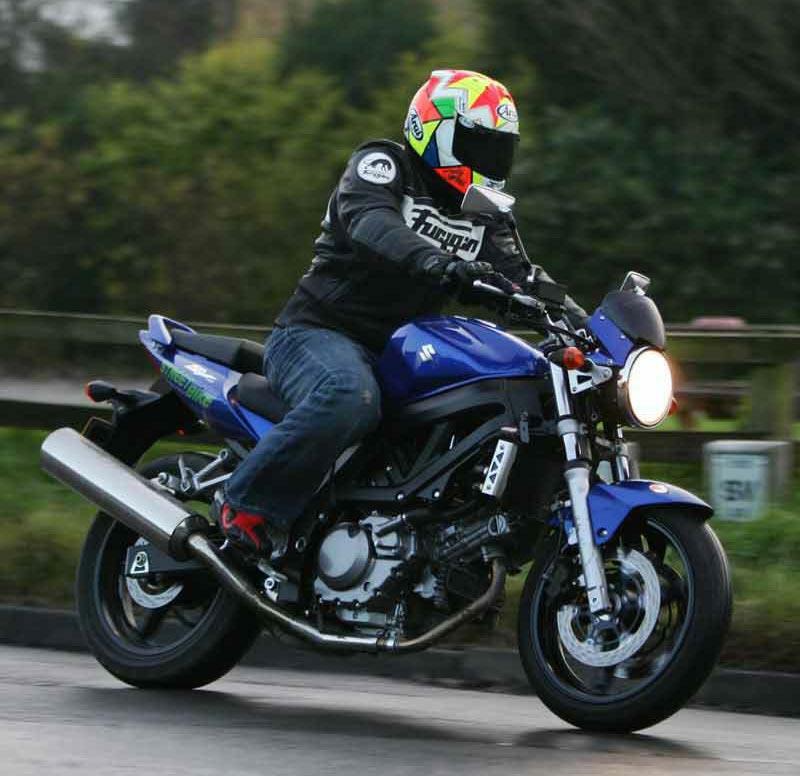 Thanks again to www.sv650.org for their knowledge and advice on the Suzuki SV650. What do you think? 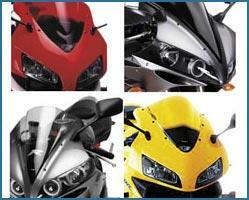 Are there any great SV650 products we missed off that you think deserve a mention? Let us know by commenting on this article below.